The Keystone View Company was founded in Meadville, Penn., by Pennsylvania native B. L. Singley (1864-1938), who had been a salesman for the stereographic producer and distributor Underwood & Underwood. The first prints sold under the Keystone name were Singley's own photographs of the 1892 French Creek flood. Incorporated in 1905, Keystone opened its Educational Department, creating products designed for classroom use, with an emphasis on social studies, geography, and the sciences. As the company grew, with branch offices in several major cities and staff photographers all over the world, it acquired the stereographic inventories of several of its competitors, including Underwood & Underwood, becoming the largest company of its kind in the world. In 1932, Keystone launched its Stereophthalmic Department, which included stereoscopic vision tests and products for correcting vision problems. Singley retired as Keystone's president in 1936 or 1937, and Keystone was bought by Mast Development Company in 1963. 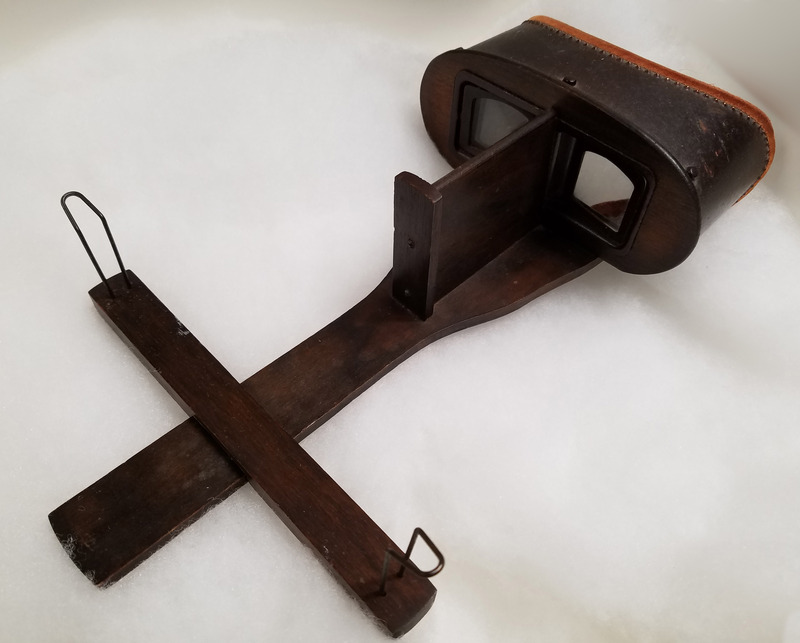 This 1923 boxed set, World War Through the Stereoscope, part of the "Stereographic Library" and housed in a box imitating the look of a two-volume set of books, contains 100 images of World War I and just after, taken ca. 1917-1921. The stereographic prints are pasted onto Keystone's distinctive grey curved mounts, with extensive descriptive information on the reverse of each mount. Prints are numbered with identifiers those beginning with "V" were originally Underwood photographs as well as numbers indicating the order in which they are to be viewed. The stereographs are accompanied by a viewer, also manufactured by Keystone. The Keystone View Company was founded in Meadville, Penn., B. L. Singley. Born in 1864 in Union Township, in southwestern Pennsylvania, Singley was a student at Allegheny College in Meadville while working as a salesman for the stereographic producer and distributor Underwood & Underwood. The first stereo cards sold under the Keystone name were Singley's own photographs of the 1892 French Creek flood. The novelty of viewing images in three dimensions, whether of a natural disaster, world events, or tourist sights, coincided with evolving technologies for popular entertainment. By 1905, Keystone was incorporated and opened its Educational Department, creating many educational products and sets designed for classroom use, with an emphasis on social studies, geography, and the sciences. Although still headquartered in Meadville, it had branch offices in several major cities and staff photographers all over the world. By 1920-21 Keystone had bought the stereographic inventories of several of its competitors, including that of Singley's former employer, Underwood & Underwood. Ultimately boasting an inventory of more than 50,000 images (sometimes claiming as many as two million, though these numbers are generally thought to be inflated), Keystone became the largest company of its kind in the world. In 1932, Keystone launched its Stereophthalmic Department, which included stereoscopic vision tests and products for testing vision and training and correcting vision problems. Singley retired as Keystone's president in 1936 or 1937 and died in 1938. Under two longtime employees, Keystone continued to operate until it was bought by Mast Development Company, of Davenport, Iowa, in 1963. As a subsidiary of Mast, it produced telebinoculars, eye-training equipment, and overhead projectors. Keystone's stock was donated to the California Museum of Photography in the late 1970s, but the Keystone name continues to be used on eye-training equipment. This boxed set, sold as World War Through the Stereoscope, part of the "Stereographic Library" and housed in a box imitating the look of a two-volume set of books, contains 100 images of World War I and its aftermath, taken from about 1917 through 1921. Keystone issued several boxed sets of stereographic views of the Great War; this set is probably from 1923. The stereographic prints are pasted onto Keystone's distinctive grey curved mounts, with extensive descriptive information on the reverse of each mount. Prints are numbered with identifiers those beginning with "V" were originally Underwood photographs as well as numbers indicating the order in which they are to be viewed. Numbers also show where images overlap with other World War sets from 1923, of as few as 75 images and as many as 200 and 300. The stereographs are accompanied by a viewer, also manufactured by Keystone. Gift of Ed Klekowski, May 2017. Processed by Caroline J. White, 2017. Cite as: World War Through the Stereoscope Collection (PH 077). Special Collections and University Archives, University of Massachusetts Amherst Libraries. Singley, B. L. (Benjamin Lloyd).